At least three Democratic senators own significant health care industry stocks that could undermine their Senate leadership’s push against the nomination of Rep. Tom Price, President-elect Donald Trump’s nominee as secretary of health and human services, The Daily Caller News Foundation’s Investigative Group has learned. Price, a Georgia Republican, has been harshly criticized by Democrats for owning up to $300,000 worth of stocks in major health care companies like Aetna, Amgen, Athena Health, Eli Lilly and Co., and Pfizer. Price has been among the most vocal Obamacare critics in Congress. Top Senate Democrats attempted Thursday to put additional pressure on the Price nomination by requesting an Office of Congressional Ethics inquiry to determine if Price broke any laws by owning the stock. But the attack on Price could be blunted by the three Democratic senators also owning significant stock in health care firms. The Democrats’ ownership interests were listed in Senate financial disclosure forms reviewed by The Daily Caller News Foundation. Congress passed the “Stock Act” in 2012 to discourage congressmen from buying and selling corporate stocks based on their insider knowledge of pending legislation. Sen. Sheldon Whitehouse, a Rhode Island Democrat, owns stock in major insurance companies that benefit from Obamacare, including Aetna, United Healthcare, and Anthem. He also owns stock in many biotech companies, including Amgen, Celgene, Biogen, and Gilead Sciences Inc., as well as pharmaceutical giant Merck and the prescription-writing company Express Scripts. Jointly, Whitehouse and his wife also owns stock in CVS Caremark, Bristol-Myers Squibb, Biogen, Gilead Sciences Inc., and Johnson & Johnson. The Whitehouse family’s total investments in the health care industry totals $805,000. Sen. Tom Carper, a former governor of Delaware, has been in the Senate since 2000 and now sits on the Senate Finance Committee, which votes on legislation proposed by its subcommittee on health care. He also is a member of three health care-related caucuses in the Senate. Virginia’s Sen. Mark Warner is the Senate’s wealthiest member and has extensive investments in the health care industry. He sits on the Senate Finance Committee’s health care subcommittee. Warner’s investments favor biotech companies, including Halozyme Therapeutics, Intrexon Corp., Harvest Intrexon Enterprise Fund, and MedOptics. His total health care industry stock investments are worth in excess of $1 million. Warner also owns stock in Ziopharm, which saw its stock fall in June 2016 when it announced that a cancer patient died after being injected with a substance produced by the biotech company. The substance was not part of its main experimental program but the stock plummeted 18% in June and is still at historic lows. Warner, whose fortune is estimated at nearly $91 million, holds his stock in a blind trust. Schumer was joined by Democratic Sens. Patty Murray from Washington state and Ron Wyden from Oregon. “We don’t know if he broke the law. But there is certainly enough serious questions to warrant a serious investigation,” Schumer conceded. Price was a practicing orthopedic surgeon for 20 years before being elected to Congress. 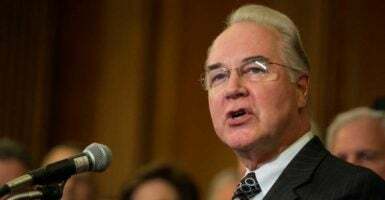 During the House Obamacare debate, Price led an informal caucus of physician lawmakers who opposed the program. This article was originally published by The Daily Caller News Foundation.